Our family's favourite movie studio is Studio Ghibli. 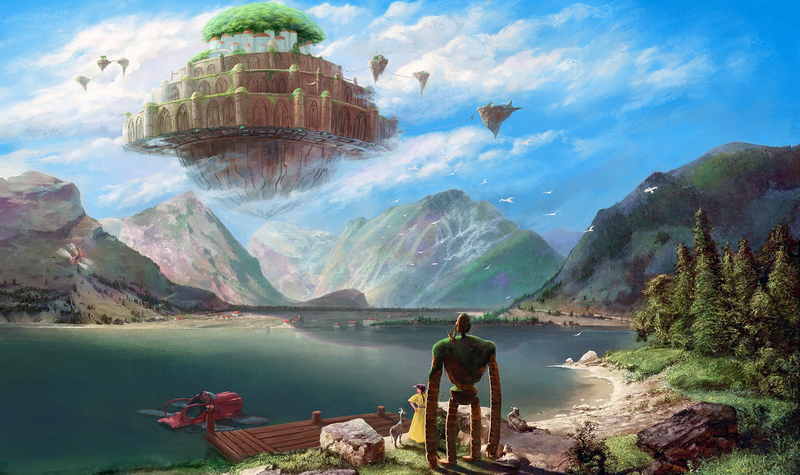 Ghibli's first animated feature film was Castle in the Sky (also known as Laputa: Castle in the Sky in some regions). It centres on Sheeta, a young girl who is descended from the royal line of Laputa, an island that floats in the sky. Laputa floats due to the power of a giant crystal of volucite (also known as aetherium in some versions). Volucite also enabled the Laputans to develop highly advanced technology and weapons, but at the time of the film, Laputa itself and its technology are largely mythical, having been abandoned and lost for many generations. Sheeta teams up with Pazu, an orphan from a mining town. His deceased father once took a photograph that included a glimpse of Laputa in the clouds, but it was disbelieved as a fake and Pazu is determined to vindicate him. I would recommend people of any age to watch the beautifully animated movie, as I cannot do it justice in a few sentences. I will just add a few more notes below that were floating around my mind as I put this together. Sheeta has a powerful volucite amulet that responds to spells. It can help her float and also communicates with Laputa and the giant sentinel robots that the Laputans developed. Laputa is a beautiful place that ultimately ends up being centred around a very large tree; despite Laputa's advanced technology and weaponry, the story returns to the theme of nature, as do many Studio Ghibli films. The director was inspired by visits in the 1980s to a Welsh mining town at the time of the miners' strike. The movie may sound like a strange steampunk mash-up of Wales, Japan, Gulliver's Travels, and air pirates, but what is not to like about that! This cache is only loosely inspired by the movie, in that there is an amulet secured in a tall tree. You will either need to float up to it, or more likely climb with ropes. You will need a password to log a find. Sheeta's amulet will reveal this, although you will need to bring 2xAAA batteries, since Laputan technology is not what it used to be. The cache is not at the published coordinates.